It is probable that you know about Dean Potter’s death this past weekend; flying into a cliff while wingsuit flying in Yosemite. Like most attentive climbers in the 90s, I first heard the name Dean Potter in a tiny Wild Things ad in either Climbing or Rock and Ice, showing the above photo (or one close to it) with a small notation that Potter was doing the first ascent, free solo, of the 5.13 King Tut. Soon after came a series of Prana ads during that brands golden age, including a particularly striking one of the very lanky and ripped Potter spanned out on King Cobra in Yosemite, and soon after that came speed soloing in Yosemite and then Potter’s 2002 season in Patagonia, which cemented his status as one of the most influential climbers, ever. In many ways the Delicate Arch controversy, base jumping, untethered slacklining, and wing suiting have all been afterwords to five-odd years of phenomenal climbing around the turn of the century. M and I lived in Moab for most of 2004, and saw Potter around town occasionally. Out of all the several thousand Moab residents, and the endless tourists passing through, he was by far the most easily recognizable in the grocery store, just as impossibly tall and chiseled and wild-haired in real life as in print. 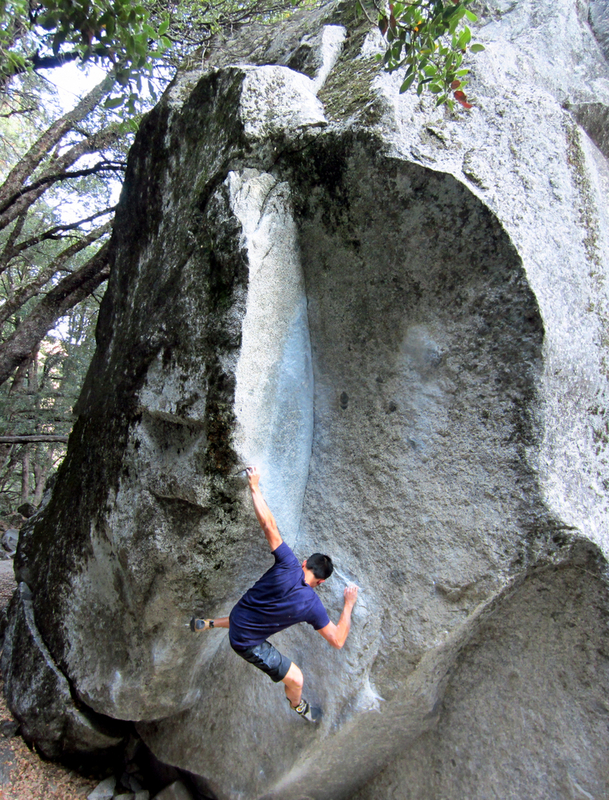 2004 was the end of my serious involvement in climbing, and I had enough fitness and skill left to attempt to follow the inspiration Potter had given me. I climbed the Crackhouse in 2 segments, free soloed the Owl, never got past the third move on King Cobra, and onsighted Coyne Crack . These days I climb a few days a years, and my fingers can never keep up with residual skill, strength, and muscle memory. I followed Potter tangentially over the past decade, more than well enough to be saddened by his death. The front page of Potter’s website says “Let go, when I do this whole new world opens up…” And this is the real value he leaves behind. The sudden death of such a defiant figure has brought more than the typical number of armchair critics out of the shadows, with the usual cries of a selfish and myopic life life ill-spent. Apparently Potter leaves behind no children, and thus in my mind public comment is out of bounds. What does seem relevant is the vigor of the vitriol, and the great extent to which it is detached from reality. The people most critical of Potter are not climbers themselves, almost without exception, and I do not think this is a coincidence. Ours is a society constantly looking for ways to let go, while at the same time being terrified of actually doing so, and lashing out at people like Potter who demonstrate that actually letting go could be a daily event. There are many ways to let go which do not involve a reasonably high probability of death; I’ll never base jump, and had an early retirement from ice and alpine climbing, precisely because the numbers were so bad. All paths to letting go do not involve unusual exposure to death, but they do without exception involve exceptional exposure to failure. This, and the challenge to social appearances it inevitably entails, is why our society would prefer to put letting go off on drugs and media experiences in private, dark rooms rather than on small, daily choices. Dean Potter, and his life and death both, remind us that we all want to let go and exceed our present selves. The only ambiguity ends up being what we want to let go, and how. Nice tribute. Great message. I didn’t know of Dean Potter, but now I do. Thank you. 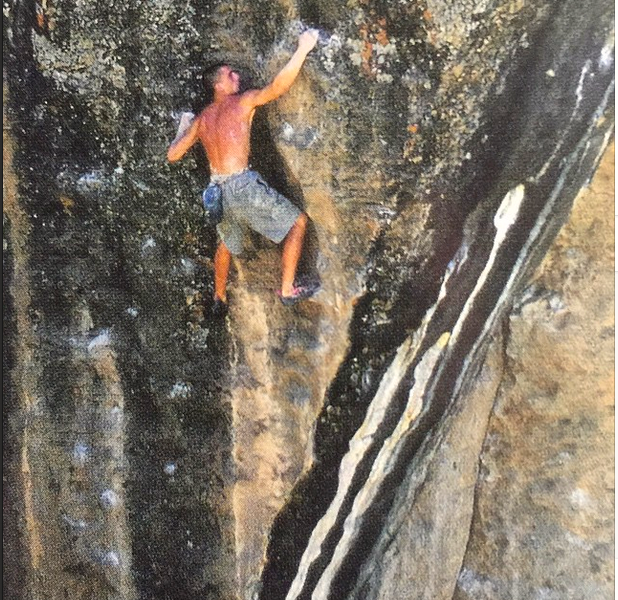 Dean was a big influence on my climbing during the late 90s and early 00s. I met him a couple of times, even climbed a bit with his wife at the time, though did not get to know him very well. I tried my hand at his moveable anchor soloing techniques, but quickly came to the realization that I lacked the mental fortitude for such feats. I wrote a longer reply but it disappeared into the void…. I will just say I for one can’t cleanly wrap his legacy up in the fashion you did. His action after the mid-aughts are not “afterwords” in my book but defining moments. Delicate Arch was not an isolated event as he also “selfishly” left slackline rigging between the Three Gossips for multiple days and had no problem BASE jumping illegally in national parks. His actions in Arches undoubtedly catalyzed (but not alone) the transition from a relatively user friendly park to a much more hands-on policy that is now restrictive. High profile deaths like his rarely benefit policy for the outdoor and adventure communities. I could care less how people risk their own bodies personally. But I can’t separate Potter’s personal pursuits from his public ones when he so thoroughly embraced being an sponsored athlete and ambassador. Nor can I separate his actions from the culture that treats young men’s bodies as cannon fodder. I understand why individuals like yourself learned from him and value his influence but there are plenty of reasons beyond vitriol to see his overall legacy as negative and highly selfish (in this case valuing his personal gain at the definable loss of the overall community he represents). You were still guiding in Moab when that went down, yes? The impact of the Delicate Arch debacle is something I hadn’t thought about enough, obviously, and given how blindly he walked into that the whole affair just seems absurd and indeed unjustifiable. At the same time, odd and interesting just how much attention it got. Beyond the higher probability of nasty body recoveries, I have a hard time understanding the NPS policy towards BASE. In Yosemite in particular it seems like a Hatfield/McCoy situation. Yeah, I guided in the Moab area through mid-2006. I actually believe there is reason to conclude his exploits there also led to the closure of the park to commercial guiding soon thereafter. Through the middle of that summer Arches had been a rare treat as far as climbing, rappelling and backcountry exploring. That is no longer the case by any means. Its really a shame as I think private and commercial enterprises has done a solid job at balancing personal endeavors with other user groups in mind for decades. I would actually argue his actions on the Three Gossips was much worse in the long run but Delicate Arch is such a symbolic feature of the park, the state and the regional geology so it created more outcry. BASE jumpers could have a leg to stand on if their high profile athletes would stop jumping illegally and then dieing within the very parks they poach. The level of entitlement their community seems to generically embrace over the past decade is difficult for me to support when so many other communities have made efforts to compromise with the NPS. But I don’t believe the community has any desire for a good faith relationship with the park when you consider the very illicit and clandestine history that seems inherent to the very definition of BASE. Time and again the community and its highest profile members jump illegally from both private and public features. I think the only way they are going to have a meaningful place at any table is if they confront that tendency but I haven’t ever heard of a concerted effort to do so. If they did so I think they might have an argument to overturn the use of the CFR that has fully banned them for decades. It would be interesting to see what the hang gliding community has done to work their way into some parks as it highlights that the CFR doesn’t completely ban any of those endeavors but gives the park service the ability to regulate and permit in a limited fashion.